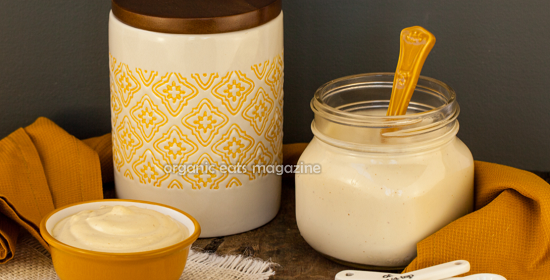 Sneak peek from the January 2014 issue of Organic Eats – Clean Whole Food Recipes Magazine. 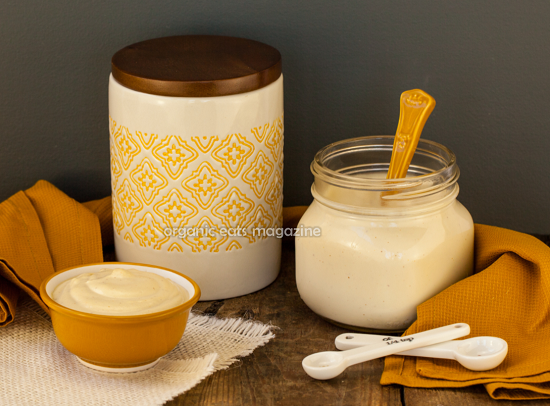 Vegan or Plant-based No Mayo Mayonnaise recipe is also Paleo or Primal Friendly. DIRECTIONS—optional, soak cashews in filtered water for a few hours before blending for a smoother mayonnaise. Add all ingredients to an inverted blender cup and blend until a thick, creamy paste forms. You may need to stir the mixture several times, as you keep blending it. Add additional water, if mixture is too thick. But you want to use as little water as possible and keep mixture as thick as you can. Use no-mayo mayo as a spread on sandwiches and wraps. Or in place of mayonnaise in your favorite salads like egg salad, tuna salad, chicken salad, etc. Store in a jar in the refrigerator and use within a few days.